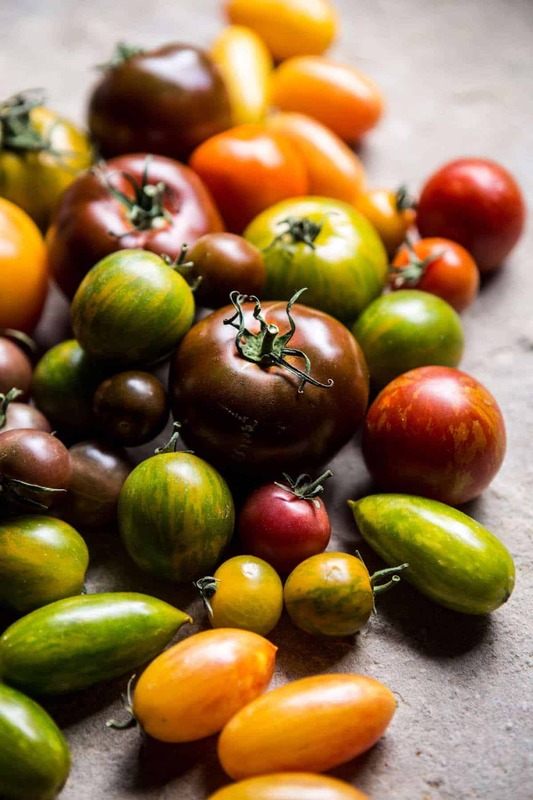 Honestly though, have you ever seen such pretty tomatoes?! I know I’ve been talking non-stop about tomatoes for the past two weeks, but oh my gosh, I think this summer’s tomatoes have been the best! Of course the discovery of these beautiful little gems at my local farm stand was probably a major factor… I seriously cannot get enough! Sooo, you want to know how this pretty little tart was created? Well, it goes a little something like this. I bought way too many tomatoes from that same little farm stand and had not a clue what to do with them. I was hiking the next morning, thinking to myself, there’s no way on Earth I am going to let the best tomatoes ever just sit on my pantry counter and go to waste. Plus, I just really, really wanted to take more photos of the tomatoes, I am obsessed. Malachi: “Tieghan, like what the hell do we need all these tomato shots for? Pretty sure we just wasted ten minutes filming tomatoes sitting on a counter. Like, are you insane?”. Tieghan: “The tomatoes are the star of the show, they’re gonna make the video”. Anyway, I decided on my hike that I needed to come up with a simple, but creative way to use the tomatoes. A recipe that would really highlight their incredible colors and flavors. I love the combo of cheddar + tomato, so that was a must. But I needed something a bit more. I decided to add a little basil and um… the everything bagel spice. I have to say, this spice kind of makes the tart. It’s so simple, but really packs on the flavor. The sesame seeds pair really nicely with the raw tomatoes and the gooey melted cheddar cheese. 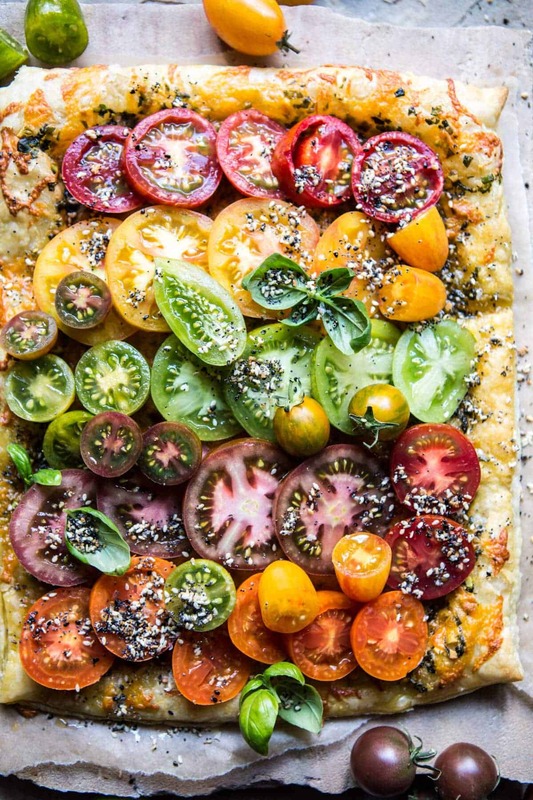 For real, this heirloom tomato cheddar tart with everything spice is perfection… like beyond belief, SO delicious! All you need is puff pastry, basil pesto, cheddar cheese, tomatoes, olive oil and then that magical everything bagel spice (made with sesame seeds, dried onion, dried garlic, poppy seeds, salt and pepper). It really just doesn’t get any simpler. 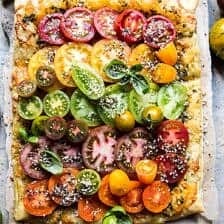 Also, while I left my tomatoes raw and allowed the warm tart to slightly heat them up, you should know that this tart is great with the tomatoes baked on top in the oven as well. 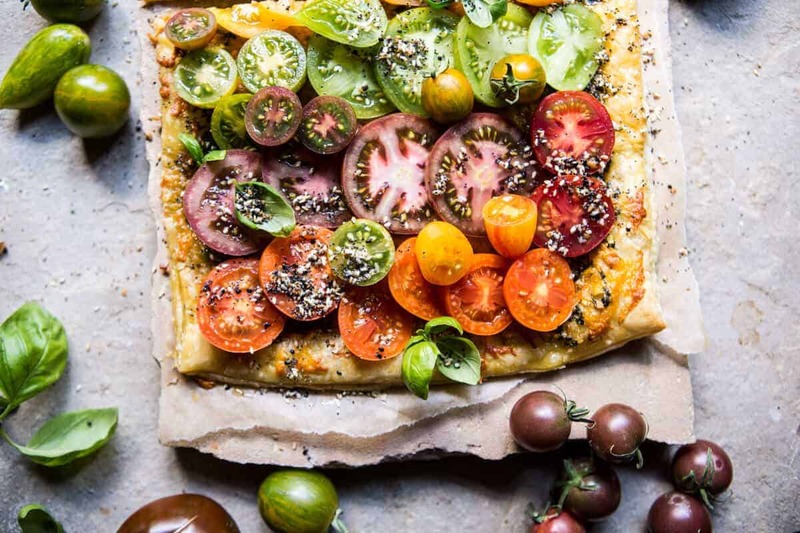 I guess I do prefer them raw, since the tomatoes are just so good right now, but if you find yourself with some imperfect tomatoes, just bake them right on top of the tart. It’s a little more like pizza then, but I don’t think anyone will be complaining. Serious question though: are you guys totally over the tomato recipes? I’m crossing both fingers that your answer is NO. I am still going full force with these late summer tomatoes and I really hope you guys are with me. Double also?! 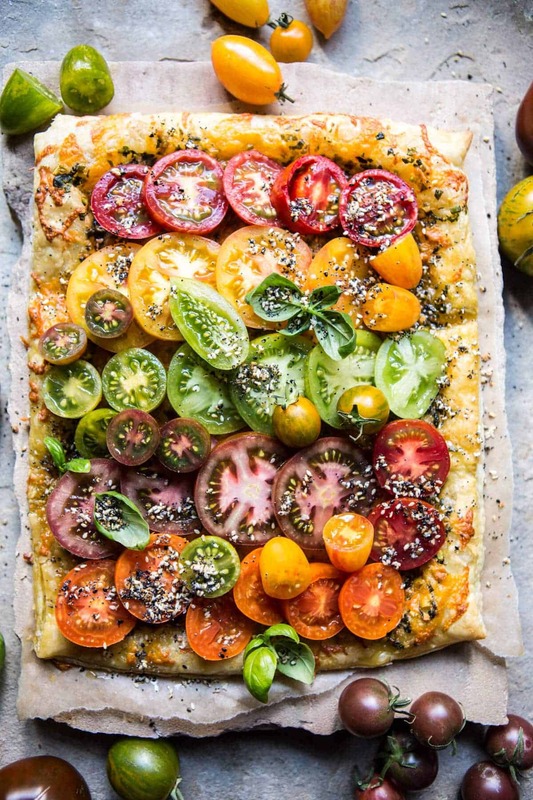 Can we please agree that tonight’s dinner NEEDS to be this tart? I mean, for one you can have it ready for eating in just about thirty minutes, and two… it really is the best freaking thing ever! 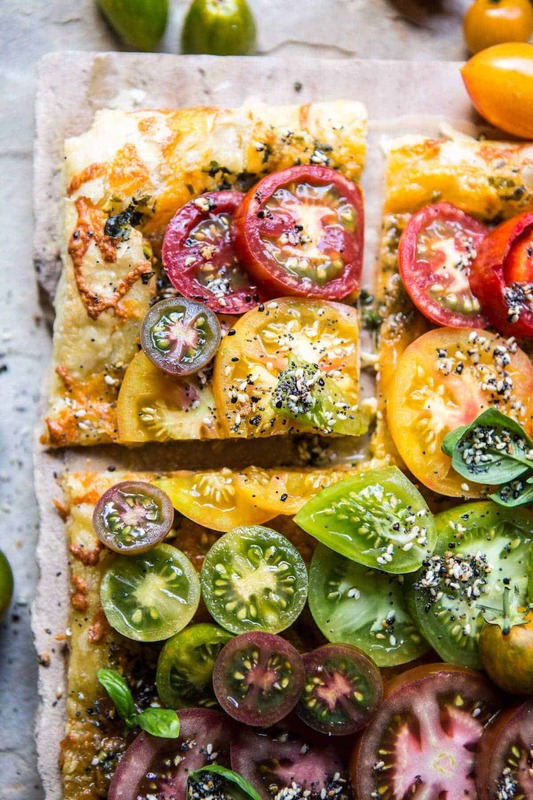 Puff pasty + basil pesto + cheddar cheese + heirloom tomatoes + everything spice?! 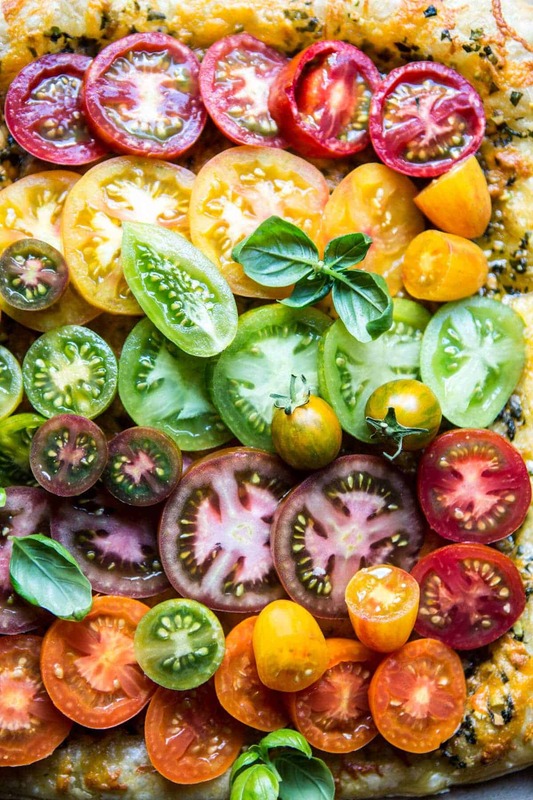 Heirloom Tomato Cheddar Tart with Everything Spice. Lay the thawed puff pastry on the prepared baking sheet and prick the pastry with the tines of a fork. 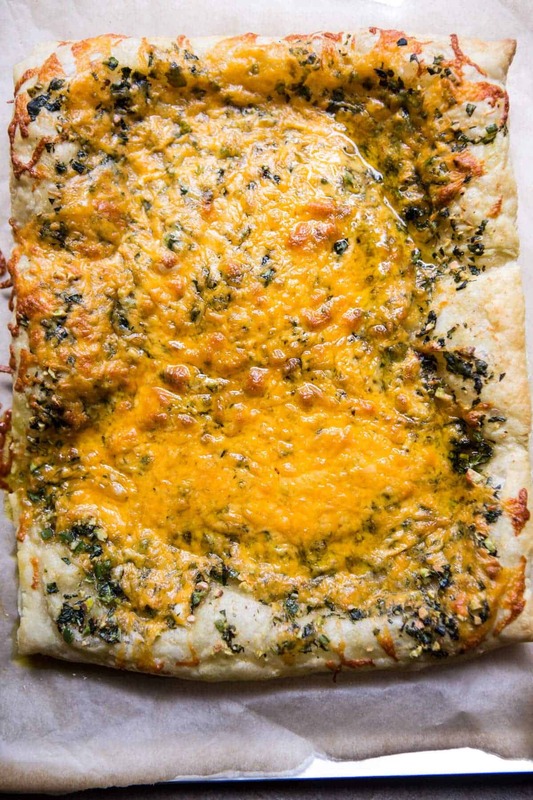 Spread the pesto over the dough, leaving a 1/4-inch boarder and top with cheddar cheese. Bake for 25-30 minutes or until the pastry is golden and the cheese has melted. Combine everything in a small bowl or glass jar. Keep stored in a cool, dry place. 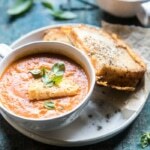 6 Ingredient Creamy Roasted Tomato Soup. OMG, I already see myself eating this tart! Yummy yummy! I think tomatoes my be my new favorite veggie. So pretty. This is gorgeous!! Seriously mine too, they’re just so pretty! Haha, I’m still laughing at the tomato filming argument ’cause that’s like the story of my life. I know exactly what you mean about loving to photograph colorful and natural foods, they’re the best. Also the best…this TART! I am so loving each piece of it, especially the everything spice on top, YUM! Thanks Tori, so happy you like the tart! 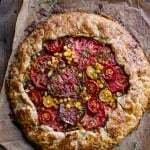 Yea so I’m all over this tart with unbaked tomatoes, I haven’t had a real good tomato yet this summer and that’s real sad, and I’m from New Jersey. I better remedy that real fast. So happy you like the tart!! Thats seriously sad to hear!! You need to get out and find some good ones!! Maybe make this when you do ? These tomatoes are spectacular! where on earth did you find these? so beautiful!! Ah, thank you!! I got them at a food stand down the road from me!! They’re perfect! 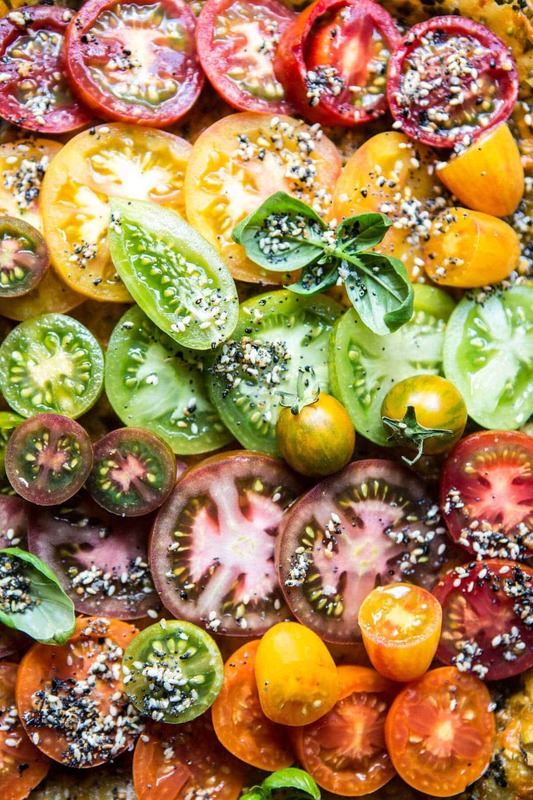 Love how you kept the tomatoes raw, especially since you’re using heirlooms, they are jewels on their own. Bring on as many tomato recipes as you want. I’m all in for as many as I can eat while the season lasts! Thank you!! So happy you agree!! I can’t get enough of them! Heirloom Tomatoes! Wow. I Need to buy some as well. Looks so amazing good. I will grow my own tomatoes next year and can’t wait. In the meantime I Need to buy them in the store. 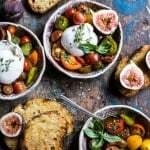 Such a great Weekend recipe. Thank you. Thank you!! Growing them will be amazing!! Hope you love the tart!! Thank you! Wow! So simple yet so appealing! I think you have sorted out my Sunday lunch (and probably dinner… the leftovers are always the best part! I wish I could find tomatoes that nice! Also, this tart looks spectacular. Haha! YES, me to!! I never want the season to end!! Heck Yes I’m totally with you on more tomatoes! I had a picture in my mind about your conversation, it’s just like my hubby would not understand why and then I would say, whatever, just do it lol And I totally get you, these pretty babies need to be the star! I can so make this simple yet beautiful dish. ? Haha exactly!! They’re the best!! I was just wondering if you stopped posting on the half baked harvest app? I love the app because it is so easy and convenient. I like to bookmark recipes I want to make. Just curious since it hasn’t been posted on since Friday last week. Hey Kristen!! No, I have not intentionally stopped posting on the app. I am not sure what is going on, but I will look into it right away, thanks for letting me know!! If the problem continues can you let me know? Thank you and so sorry for the trouble! Thanks for responding. It seems to be working again now because the posts are up. Thanks again, and I’ll let you know if I experience anymore trouble. Awesome!! Hope all continues to work! ok, so how many acres of tomatoes do you have! And how many of those are heirloom? I am totally jealous and inspired to get to the farmer’s market!! Thanks Karen and have a great weekend! This almost looks too good to eat! 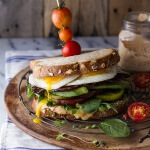 I can’t decide which I love more: your recipes, or your gorgeous photos! Thank you so much Allison!! We have a recipe that’s really similar to this that’s a family heirloom, and it’s cool to see that other people make it something like it, too! This one looks absolutely delicious. Thats awesome!! I’ll have to check it out! This is such a stunning tart, Tieghan! 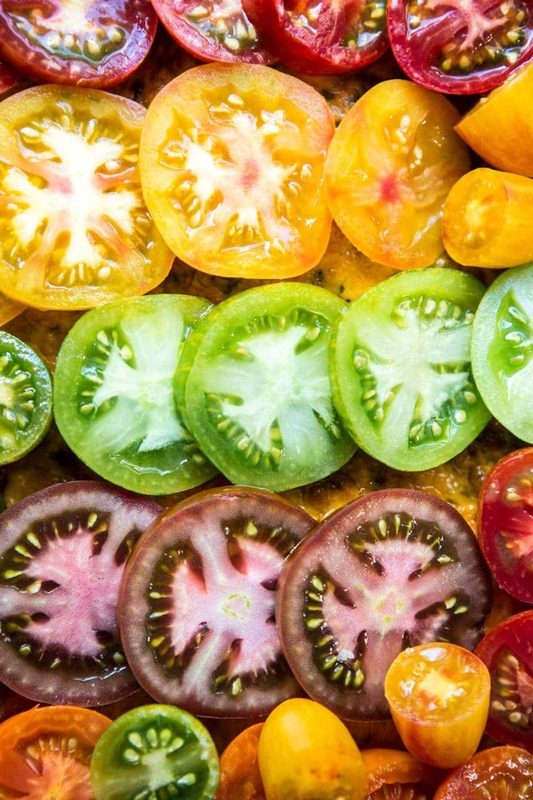 I love heirloom tomatoes and can’t wait to try this! Thanks Laura!! Its one of my favorites, so I hope you love it!! Now she’s eating her mamane and I wonder how can get such beautiful and colorful tomatoes here, in Brazil. Just in love with tour blog! They are in season during the summer here in America! I am so happy you love my blog, thanks so much Tathyana!? 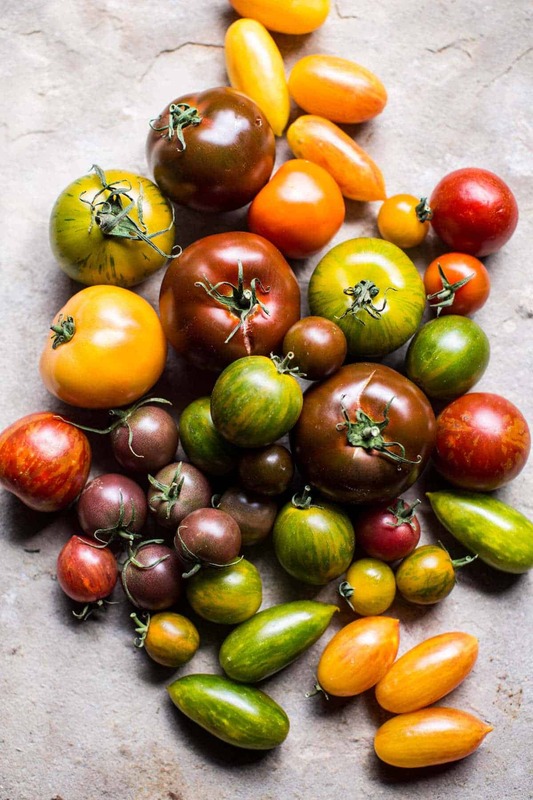 Combined with many varieties, it looks great, I love recipes with tomatoes. Hi Barbara! I am so glad you enjoy my recipes and hope you continue to in the future! It is perfectly okay to use the photos from my recipes, with credit to Half Baked Harvest, but please do not copy the recipe. Let me know if you have any other questions and thank you for reaching out! Do you thaw the pastry first? Gotta try this!